The Downward Facing Dog Pose is great for tight hamstrings. Whether you travel a lot, work as a "desk jockey", or seem to stiffen up after a brisk walk, there are numerous yoga poses for tight hamstrings that help you relieve tension. The asanas below demonstrate a variety of ways you can stretch your hamstrings, even at a beginning yogi's level. Share these tips with your favorite runner, too, as he or she may experience a greater release through the hamstrings for longer periods of time than just stretching against a wall. 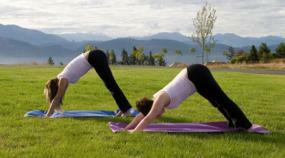 Below you'll find a number of yoga poses that can help you stretch and loosen your hamstrings. Hold these poses for up to a minute on each leg for the best results. Also make sure to go through a 10-minute warmup before any yoga or cardio routine. Give each of these poses a try to decide which ones work best for you. Practicing yoga is a great way to get in better shape. Look for more helpful poses in our Yoga Pose Gallery.